Mahjong Arena - Who’s Taking My Tiles? Imagine a game of Mahjong in which, from time to time, some of the tiles disappear, getting taken from the board by someone else: your opponent (who can be your best friend, if you want) that plays the same game, on the same board, at the exact same time as you. You don’t have to imagine anymore: Thursday, April 25th, Mahjong Arena was officially launched at The Next Web conference in Amsterdam, in the presence of Willem-Alexander, Prince of Orange, future king of the Kingdom of the Netherlands. 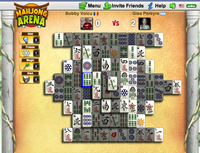 Mavenhut's second game, Mahjong Arena, is a reinvented classic, brought to the social age of Facebook, similar in style with Mavenhut’s already popular hit, Solitaire Arena. Players from around the world compete in head to head mahjong matches that test their speed and attention. The purpose of the game is to match tiles of the same kind faster than your opponent. You compete on the same board and you start with equal chances, so who will be the best? Of course, through leaderboards, you can compare your results with people from around the world, people from your country or, if you just want to keep it friendly, with your Facebook friends. Mavenhut builds social games with a classic flavor. We’re like George Lucas bringing Star Wars (the old series) to the 21st century: better gameplay, social features.